Almost all of us who live with dogs have experienced working through some kind of trauma at one time or another. Many of us have dogs living in our homes who have been rescued from a bad situation. Others of us may have dogs who have been through some kind of ordeal such as a long, difficult recovery from an illness or injury. The system of Reiki gives us several tools to help us meet these challenges with grace and bring great healing potential to any situation. Reiki is a meditative practice that nurtures heart-to-heart connections with others. This creates healing because true healing starts where our hearts connect. Because of its gentle approach where animals lead each session, Reiki is ideal for helping even the most sensitive dogs heal from trauma. The Reiki Space is a sanctuary where your dog can go to heal. It’s not an outer physical place, but rather an inner sanctuary of comfort and happiness, where the body, mind and emotions can restoratively align. The Reiki Space is a place that is created through compassionate connection. It is alive and HERE and NOW, so that trauma loses its power because it is simply dust of the past. But what exactly does that mean – to create a “safe Reiki Space” for dogs so that they can heal themselves? If we look closely at the Reiki precepts, we can see many keys to help unlock this natural, inner healing potential. The Reiki Precepts are: For today only, do not anger. Do not worry. Be grateful. Practice diligently, and show compassion to yourself and others. If we can learn to embody the Reiki precepts, we can begin to experience a deeper and more balanced way in the world. When we learn to stop and breathe, listen without judgment, and look deeply to the heart of things, it is within our ability to transform and relieve the suffering of the animals we love. The Reiki precepts “do not anger” and “do not worry” point to the power of staying in the present moment. When we are angry or worried about something that has happened to us in the past, our energy becomes very unsettled and it becomes very difficult (if not impossible) to be right here, right now. As the caregiver for a dog who is carrying trauma from the past, in the form of anxiety, fear or aggression, it is easy for us, too, to become caught in the past. We might, without realizing it, begin to focus beyond the trauma behaviors our dog is showing, spinning stories in our minds about what may have happened to them to cause this behavior. In this way, without meaning to, we might begin to identify our dog with what is “wrong,” rather than focusing on the positive. This can have a snowball effect of emotions within us such as anger, worry, bitterness, helplessness etc. On the other hand, we might also try to ignore the warning signs our dog is showing us, turning away from the unpleasantness or trying to power through our dog’s anxiousness. In this way we are avoiding the difficulty and not listening with an open heart to our dog’s experience and feelings. Helping our dog heal with Reiki begins with something as simple as awareness. 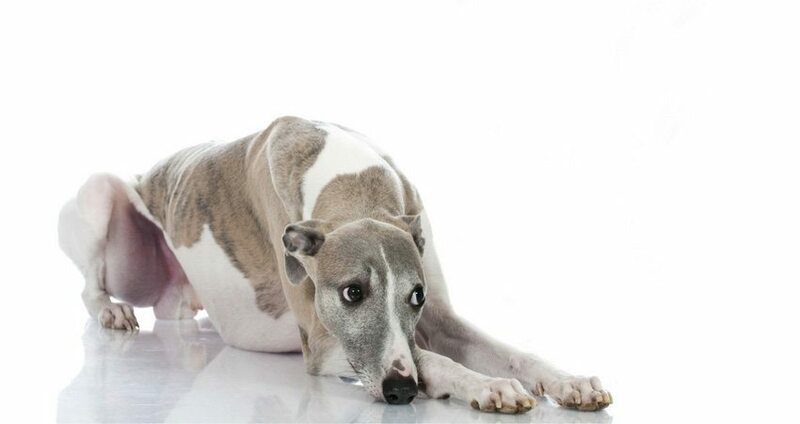 When your dog starts to show signs of anxiety, fear, aggression or any other trauma behavior, stop and breathe. Give your dog some space, and just be present and aware with her. Breathe in through your nose, filling your body with each inhale all the way to your belly. On each exhale, imagine your breath can slowly expand out your body, filling the space around you with peace. Feel as if you have roots growing down into the earth, grounding you and keeping you stable. Stay with your dog, breathing, for several minutes and notice how she responds to your quiet awareness. Our own emotional reactivity, through anger, worry or avoidance, is an energy that is very out of balance and ungrounded (like an upside-down triangle) and easy to fall apart. The more you can be stable like a mountain for your dog, at the first sign of anxiety or discomfort, the easier it is for them to shift from fear, worry or aggression back into a balanced, peaceful space. By taking the time to ground yourself, stopping to just “be” with your dog, you give her the space to express himself, without trying to avoid, fix or change the problem. It’s a simple way to reassure your dog that everything is ok, that you are here at this moment, whatever it looks like, even if it’s difficult. It is a powerful healing attitude to accept your dog even when she is not feeling her best, and she will feel your open heart and be drawn to it. When your acceptance comes from a place of peace – without anger or worry – this peacefulness is very contagious, and your dog will feel a great deal of strength and comfort from your presence. Notice how your inner positive attitude has a positive outer ripple effect in your dog’s behavior. The 3rd Reiki precept, be grateful, hold a key to opening the door to true acceptance. Even the most difficult moments in our lives shape us, help us to grow, and make us who we are. If we look with eyes of gratitude, we can see the positive in our dogs even in tough times – their strength at getting through the trauma, their courage in moving forward (at whatever pace they do so), and the depth of their forgiveness, compassion, love and joy despite their moments of anxiety or upset. Imagine your mind as a beautiful white rose bud, with many petals curled up, representing each different thought you have about your dog’s issues. Drop this rose down into your heart – allow all the petals to relax and open into the most wide and beautiful flower. As the white rose opens in your heart, allow yourself to let go of all the judgments, worries or fears and need to control or fix the issues with your dog. Imagine the rose at your heart is surrounded in a beautiful sphere of light that shines out from your being. The light is so pure and bright that all worry, fear or imbalance is instantly dissipated. Chant the mantra “thank you” as you visualize the light at your heart rippling out into the universe. Imagine your dog’s heart also as a beautiful rose with opening petals, shining out. Together your two lights become one. Sit in that bright and open space. If you find yourself getting distracted, start again with the rosebud in your mind, drop it into your heart and open the petals – imagine each thought can let go into the light as each petal opens. Notice how your heart feels as your rose becomes more and more open. Observe how your dog responds to your open heart. Sometimes we want so much to help our dogs when we see that they are feeling worried or if we see they are suffering from an earlier trauma. It can be very difficult to let go of anger and worry and find gratitude at such moments. This is why the fourth Reiki precept is “practice diligently.” Through daily meditation practice we can begin to create a beautiful Reiki Space of healing. “Reiki time” with your dog is a time to stop all “doing” and just “be.” It is time to open our hearts and be present with loving-kindness. The power of this state of being is extremely strong and shouldn’t be underestimated. There is no greater healing power than compassion! This leads us to the fifth and final Reiki precept: Be compassionate to yourself and others. Compassion is really about loving-kindness, a way of being in the world that is mindful, open and full of gratitude. Thus by practicing the first four precepts, we will inevitably find ourselves embraced by the fifth. As this precept suggests, Reiki starts with a shift of our own inner space, and ripples out to others. Often we think the system of Reiki is a way of “doing” something “to” our dogs, but in reality it is a way of learning how to “be” with them in the world – in both happy an difficult moments – that is balanced, peaceful and full of love. Our greatest healing power lies not in what we can do TO our dogs, but rather in how are ARE when we are with them. Simply breathe, nurture awareness, find gratitude and radiate compassion. No trauma is so deep that it cannot healed by the power of love, and this is the real Reiki Space that heart-to-heart connection creates.